by David Spark & Ken K.
Meetings can be anti-climactic; downright difficult to get through, even. And when vital information is being shared and its form of dissemination — projector, display, video conferencing equipment — doesn’t function, it clearly becomes time to address the obvious. The time has finally come to put away the tiring projectors, flipboards and markers associated with old meetings, or the fear of technology not working properly to accommodate large rooms of employees using business-critical time. Companies need to ease the meeting room madness with conference room technology and take advantage of digital capabilities like Samsung Flip and HARMAN huddle spaces. There’s nothing more frustrating for employees in a meeting than to lose time and patience because crucial information isn’t properly presented. So put the fear of “will it connect” in the rearview mirror and connect your company with the right conference room technology. 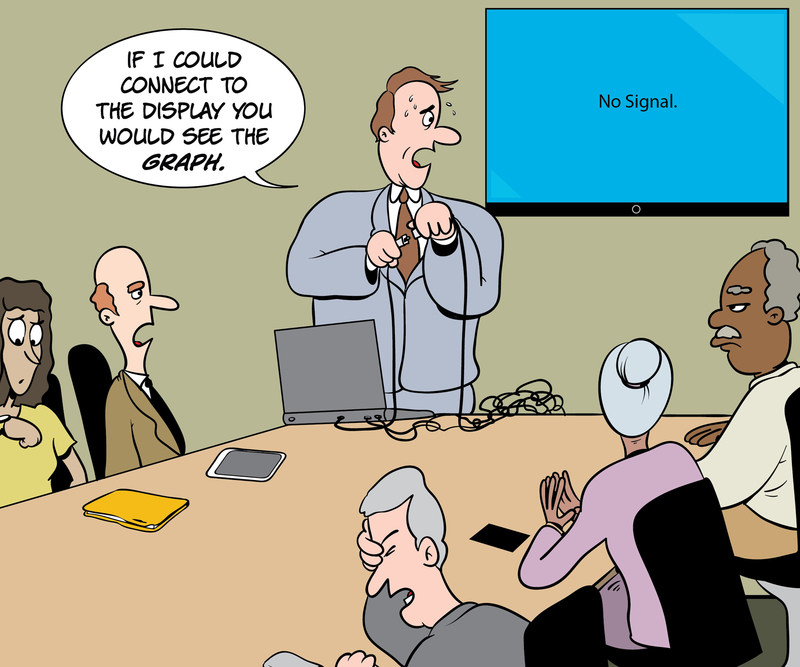 Learn more about how conference room technology solutions can ease the meeting room madness. David Spark & Ken K.
Ken K. is an artist and writer living in Los Angeles. David Spark is the owner of Spark Media Solutions, which specializes in B2B content marketing for the tech industry. He has more than twenty years of experience in tech journalism and production, plus ten years experience in advertising. David also squandered more than a dozen years working as a touring stand up comedian, a San Francisco tour guide, and comedy writer for The Second City in Chicago. View all posts by David Spark & Ken K.